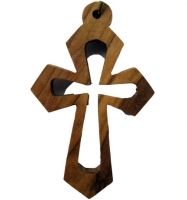 HolyLand-Gifts offers an extensive variety and selection of exquisitely crafted wood cross necklaces. These necklaces are wonderful gifts to give to loved ones, family and friends, along with religious confirmations and special occasions. Christmas, Easter, and other special religious times are the perfect opportunity to give these meaningful religious gift items from Bethlehem. With our range of cross necklaces wood, you can choose a necklace matching your specific interest and taste. No matter what you want, we offer high quality jewelry and great service at reasonable and affordable prices. Our selection of necklaces allows for a variety of styles. Our commitment to you is high quality products and great customer service. Please enjoy a wonderful shopping experience. Our wooden crosses have been meticulously crafted by Bethlehem Christian artisans, who go to great lengths to make sure each product is of the utmost quality. At our custom website, you can find a large selection of gorgeous products in our various categories of olive wood products. These gifts will enhance your spirituality and bring you closer to Christ. Awesome wood cross necklace i received, really great product.